CARPE DIEM HAIKU KAI: Carpe Diem #1142 Honshu, the "main island"
Well our journey has started and today we will go on with our journey through the land of the rising sun. We have arrived on the airport of Tokyo on the so called "main Island" Honshu. It's the biggest Island of Japan and on this part the most Japanese people live. It is here were we will encounter the ancient and the modern times of Japan. 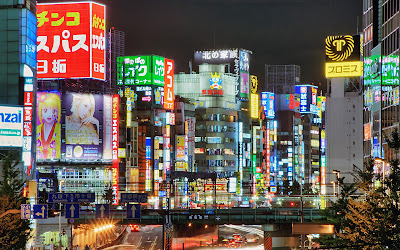 Tokyo is really a town of the world. If we look back in time than we see a very different country. Japan was a very closed country several centuries ago. It was inhabited far back in time. First signs of life in Japan are known from the Paleolithic or Old Stone Age (50.000-10.000 years ago). 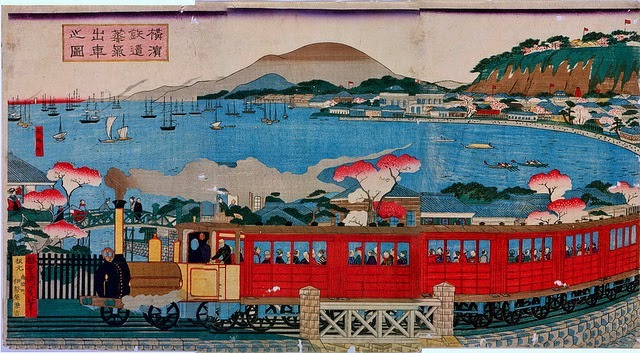 The first written mention of Japan is in Chinese history texts from the 1st century AD. Influence from other regions, mainly China, followed by periods of isolation, particularly from Western Europe, has characterized Japan's history. From the 12th century until 1868, Japan was ruled by successive feudal military shoguns who ruled in the name of the Emperor. In Basho's time, the 17th century there were in a way warm relations between my country (The Netherlands) and Japan, so we have already a relationship with Japan over more than 350 years. Maybe that's why in my country there are so many lovers of Japanese culture, not only haiku or tanka, but also sume-i, ikebana and origami. Japan a modern country with a rich history, a history they cherish, because Japan is not only the present, but also the past and the future. This episode is NOW OPEN for your submissions and will remain open until February 7th at noon (CET). I will (try to) publish our new episode later on.